A few words about the obscure, talented and tragic Tina Brooks. 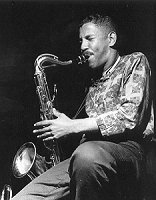 I first became aware of Brooks' playing through his work with Jimmy Smith - the session that produced 'The Sermon' and 'House Party' being one of his strongest. More recently I 'rediscovered' Brooks on Smith's album 'Cool Blues' where he plays some of the best hard-bop tenor solos I've had the privelege of hearing. Brooks recorded pretty much exclusively on Blue Note during his short career. He led only 3 sessions of his own for the label, and appeared on albums by the likes of Freddie Hubbard and Kenny Burrell. Sadly, Brooks was one of the many jazz musicians of his era who succumbed to heroin addiction, and the consequent ill health and periods of imprisonment meant that he didn't record after 1961. A listen to any of his music will confirm what a loss that was to Jazz. There's a nice tribute with discography available on the Hard Bop Homepage, have a read, it's well worth it.